Exciting News! We are thrilled to announce a TAP grant has been awarded for sidewalks and lighting on Old Shell Road from Union Avenue to Hyland Avenue. To contribute to this important project, head on over to our Donate page. Members of the Oakleigh neighborhood have teamed up with One Mobile and the City's Parks Department to bring a dog park to Crawford-Murphy park near Ann Street. A total of $8,500 is needed to turn this idea into a reality. There is a large area of grass near Ann Street that is too small for a sports field and is not being used for any other purpose. Fencing this area would provide a place for safe, off-leash play area for dogs and their owners in the Oakleigh, Down the Bay, Leinkauf, Oakdale, and Old Dauphin Way neighborhoods. For more information or to get involved, see the original idea on the One Mobile website here or donate here. 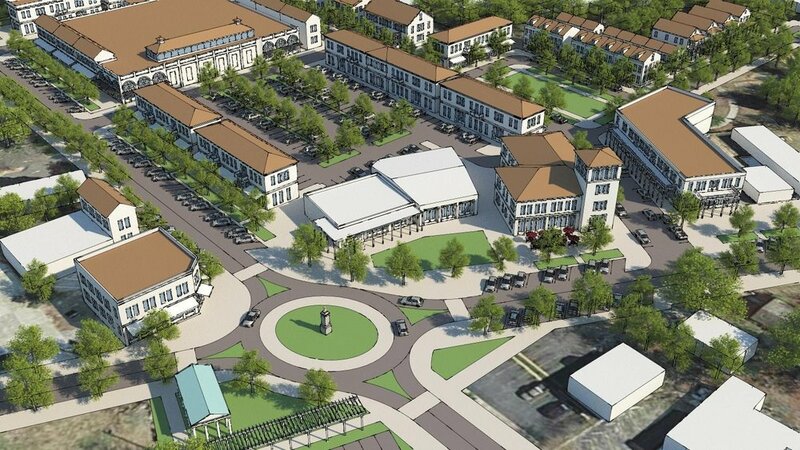 Have you seen the plan for Old Shell Road Midtown? See the entire draft plan here. At the In Progress Presentation held on November 19, 2015, 96% of the participants believed the plan was on the right track. On Wednesday, Nov 18, 2015, over 60 Midtown residents and stakeholders gathered for the charrette kick off and participated in an input session. During the input session, urban planners and designers asked thought-provoking questions and lead discussions with participants on their dreams for Midtown. Participants also collectively brainstormed and drew ideas on maps of Old Shell Road from I-65 to Broad Street. Throughout Wednesday and Thursday, an additional 55 residents and business owners dropped in for open studio sessions with the urban designers and planners to see in-progress designs and discuss ideas. Various breakout sessions were held with city representatives, developers, and business owners to discuss obstacles and solutions from their unique perspective. On Thursday, Nov 19, 2015, over 70 Midtown residents and stakeholders attended a public work-in-progress presentation provided by urban planners and designers. The presentation outlined the principles resulting from community input during the charrette and provided potential design solutions that reflect those principles. During the presentation, the audience was polled on whether the plan was on track and what types of architecture were preferred for commercial developments. The work-in-progress and additional input collected over the next few weeks will serve as the foundation for Old Shell Road Midtown plan. Click here to view the presentation slides from Thursday’s work-in-progress presentation. 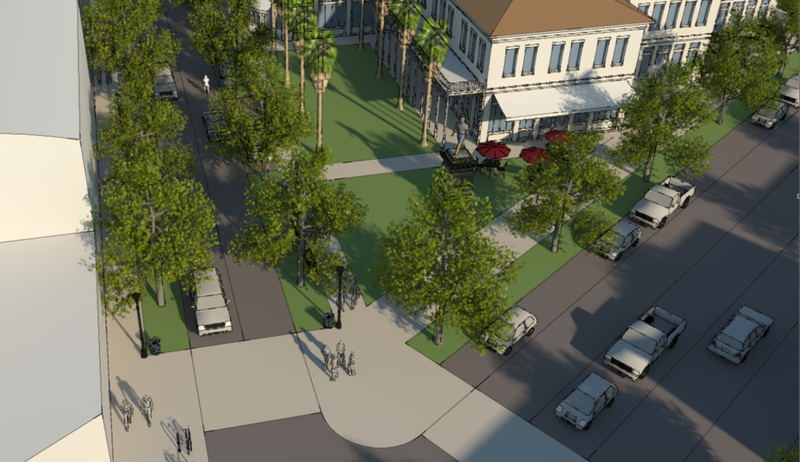 Below are concepts created by the urban designers for key intersections along Old Shell Road. See the whole draft plan here. Who's ready to make their mark? The Old Shell Road Midtown Charrette is your opportunity to set the standard for all of Midtown! Once this plan is created and in place, it will be the backbone for all future Midtown plans and improvements. We hope to see you tomorrow at 8am at the Junior League of Mobile for the kick off. First things first. What is a charrette? A charrette (pronounced [shuh-ret]) is an intensive brainstorming and planning session where neighborhood residents, merchants and stakeholders collaborate with city planners, engineers, and architects to create a vision for development. Join us for a charette with Goodwyn Mills & Cawood as we build from the visioning session held in February 2015 with Main Street Alabama to develop a plan for Old Shell Road Midtown. You will be able to share your ideas with urban designers as they work in a studio open to the public. The charette will close with a work-in-progress presentation from Goodwyn Mills & Cawood. Thank you to Councilman Fred Richardson, Councilman Levon Manzie, County Commissioner Jerry Carl and County Commissioner Merceria Ludgood for their support and funding of our plan. Thank you to the Chamber of Commerce Foundation for partnering with us. The Midtown Mobile Movement has hired the firm of Goodwyn, Mills & Cawood (who recently worked with the City on the Map for Mobile) to develop a plan for Old Shell Road Midtown! We could not do this without the financial support of Council Vice-President Fred Richardson who contributed $25,000, Councilman Levon Manzie who contributed $15,000, Commissioner Jerry Carl who contributed $12,500 and Commissioner Merceria Ludgood who contributed $12,500. The Chamber of Commerce Foundation agreed to be the non-profit receiving funds for the plan until the Midtown Mobile Movement is able to obtain its own non-profit status. We are very grateful to all of these leaders in our community for sharing our vision of a better Midtown! Creating and implementing a plan for Old Shell Road from Broad Street to Interstate 65 is the first project of the Midtown Mobile Movement. Our goals include (1) hiring urban designers to create a plan for Old Shell Road spanning from Interstate 65 to Broad Street, (2) working with City and County representatives to implement projects stemming from the plan, and (3) improving the quality of life for all residents and merchants located along Old Shell Road by making it a walkable destination. Why Old Shell Road? In late 2014, before the Midtown Movement was officially established, a group of neighbors and business owners began meeting and decided to formalize an approach to improvements for Old Shell Road in Midtown by contacting the organization Main Street Alabama. 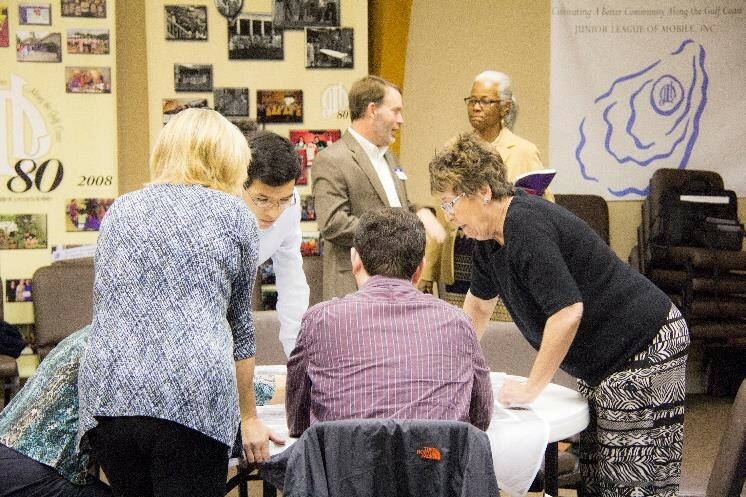 On February 3, 2015, a visioning session was conducted by Mary Helmer of Main Street Alabama at Ashland Place United Methodist Church. The invitation to participate was posted on NextDoor, Facebook, Email, and through flyers handed out along Old Shell Road to all businesses. Fifty-two residents and merchants of Old Shell Road Midtown attended. Some of the common desires of attendees were lighting, sidewalks, green space, and other infrastructure needs as well as updating the current zoning guidelines. One popular idea among attendees was the recruitment of a coffee/wine shop with bike racks. The result of the visioning session is a visioning statement that can be adopted and/or amended to guide the direction of improvements. In order to achieve this vision, a nonprofit is needed to advocate, educate and fundraise. Luckily, while these residents and business owners were working tirelessly to formalize the improvement efforts for Old Shell Road, Midtown Movement was being created. The two groups merged and are working together to create a better Midtown. The Midtown Mobile Movement started as an idea on the One Mobile website by Sam Dennis. Sam studied urban design in college and understands what it takes to connect a neighborhood by making it pedestrian and bike friendly. Residents and business owners contacted Sam through the One Mobile website and after a few beers at Callaghan's in the Oakleigh Historic District, the Midtown Movement was born! See Sam's idea on the One Mobile website here.